Attendees at the 1998 international Healthy Cities conference held in Athens, Greece, coined the term, “healthy urban planning.” Since that time, artists and designers have used data to show the public health (or lack of that health) in and around certain cities in terms of pedestrian friendliness, pollutants, environment (and changes in that environment), the availability of resources and measures of wealth, health and well-being. The following 25 information graphics offer insights into both U.S. cities and comparisons across the globe. The following list also contains some sites that offer tools that can be used by other cities to learn how to measure city health. The links in this list are organized alphabetically. 11 Most Bike-Friendly Cities in the World: This image shows the top 11 bike-friendly cities in the world, along with the top 50 bike-friendly cities in America. The infographic also includes what makes a city bike-friendly. 50 Cleanest (Dirtiest) Cities in America: While not a colorful graphic, this chart says a lot about how American cities rate in the amount of pollutants they contain in air air, water, toxins and hazardous waste. 2008 ‘Active Cities, Healthy Cities’ Contest Winners: This is an interactive infographic that shows cities with walking or biking paths, the development of high-quality mass transit, the promotion of public safety and the improvement of public space quality. Best Cities for Working Mothers: If you consider wealth, employment, cost of living, pediatrician resources, low crime rates and safe environments all part of a healthy city, then this interactive map can bring some U.S. cities into focus. Bing Health Maps: This is an app for Bing Maps (a download) that provides statistical information for the entire U.S. by county. Select a state and then select a Community Health Indicator. The map will re-center on the respective state and color-code the counties within that state based on unit-based reporting. Cities Go Climate Positive: More than half the world’s population lives in cities. This video combines infographics with narrative to show how population can impact various city climates in an increasingly urban world. Dead Man Walking: This map shows how dangerous walking might be in cities across the world. Globally, Atlanta, Detroit and Los Angeles rank the highest for pedestrian deaths. Declared disasters and emergencies since 1953: G.W. Schulz at the Center for Investigative Reporting (CIR) visualized FEMA disasters since 1953. Surprisingly fire is a major component of disasters in many states, not just the West. FEMA declared more fires than hurricanes as disasters in Florida. 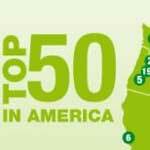 Dirty Water: Good provides an information graphic that shows the five cleanest and the five dirtiest U.S. water utilities in the country, including the populations served by these communities and the pollutants of largest concern. Health Map: Use this interactive map to learn more about health concerns in or near your city. The map focuses on outbreaks, such as flu or other communicable diseases. Healthy Cities Onkaparinga: This coalition of agencies and community members addresses health issues, and has developed a symbol that is both decorative and educational…basically, they have developed a brand that is an infographic. Healthy Cities status 2/2/03: This survey shows the questions in the survey and results by graphs. Results range from schools to racial diversity, and from clean air to recycling efforts. 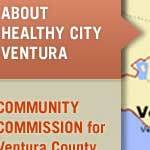 Healthy City Ventura County: This interactive site shows other community and city members how to build maps, charts and other tools to intimately learn more about a region’s health. The maps show services and demographic data, and the charts are created by community data and can be used as comparative tools. How Cars Are Killing Us Around the World: If you find a city, you’ll find cars. This graphic shows that automobiles are the main cause of senseless deaths. Your chances of dying behind the wheel (or even just in the passenger seat) of a car are around 1 in 100, compared to a 1 in 52.6 million odds of being killed on a single airliner trip. Independent Kyoto Recognition in the U.S.: This entire blog entry talks about Kyoto recognition throughout the United States. Although the maps are small, the author lists the cities that are participating. Main research themes: This information graphic shows the “determinants of health and well-being in our neighborhoods,” or how town planning and public health are long-term bedfellows. The map recently was developed by the University of the West of England (UWE), Bristol. NOAA Climate Services Interactive Map: This global map indicates locations of all the weather stations in the world. In the U.S., the easiest way to search is through zip code, or find the nearest location by county or city search. Scorecard: This site contains information graphics that show pollution across the U.S. by zip code. Users also can use the Pollution Locator to search for reports on specific areas and use charts to compare cities. The Most Polluted Places in the World: With 40 factories manufacturing chemicals, Sumgayit, Azerbaijan is rated the most polluted place in the world. This map, which ranks ten cities, also states that five million people are poisoned every day in the developing world. The Polluted Polis: This map shows that pollution continues to be a problem in cities throughout the U.S. California seems most affected, but the reach includes other eastern cities with the most unhealthy days per year, such as Memphis. U.S. Air Quality: This blog contains numerous graphics and maps that illustrate air quality in cities and regions across the U.S. using information from satellites, ground-based measurements, and models. Interpretation and analysis are provided by the staff of the University of Maryland, Baltimore County Atmospheric Lidar Group. Visit a Preserve: This global map locates nature preserves. Find a preserve located near your community to visit and learn about preservation. This map is part of a larger effort by The Nature Conservancy to map the Earth’s diversity. Western cities fare best in well-being index: Scroll down to find a typed index of healthy cities that rates health by population to basic access to health. The list is interactive, allowing users to move ranks from best to worst and back again. 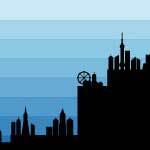 When Sea Levels Attack: This chart helps to visualize what “one metre” means in the scheme of overall sea level rise when compared to various global cities. Los Angeles, according this this chart, will be underwater long before New York or even New Orleans. World Health Organization Healthy Cities Project: This map shows 74 cities in Europe that participate in WHO’s project to promote health and well being through action at the individual local authority level. This entry was posted in Education, public health and tagged disaster maps, environment, FEMA, health maps, infographics, information graphics, nature preserves, public health. Bookmark the permalink.